Local Pueblos — Dreamcatcher Real Estate Co.
Pueblo culture and pueblo peoples are descendants of more ancient cultures dating as far back as 9,000 years ago. Some of the ruins of those ancient peoples are to be found in Chaco Canyon, Salmon Ruins, and Canyon de Chelly. Artifacts from Pueblo culture can be seen in the Millicent Rogers Museum in Taos, Kit Carson Museum in Taos, and the San Juan County Archaeology Center at Salmon Ruins. Check each pueblo’s calendar for days when there are powwows, open celebration days, and arts and craft opportunities. www.indianpueblo.org is a growing web site covering all of the New Mexico pueblos. You can find Taos Pueblo by driving north on Paseo del Pueblo Norte, and just at the bend in the road as it turns west, you will see the road and sign to the Pueblo. Before you drive out, do check the comprehensive Taos Pueblo web site to make sure the Pueblo is open to visitors as there are some days when it is closed due to private ceremonies. 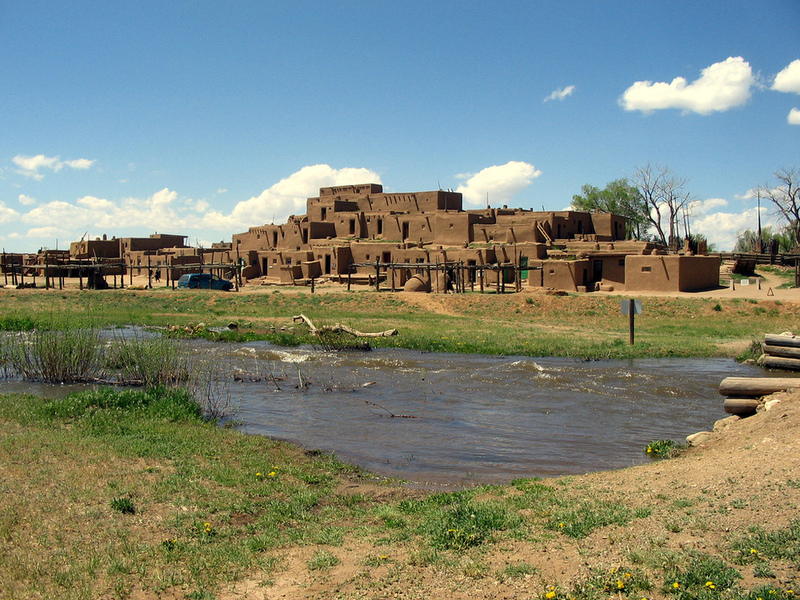 The web site is packed with information about the history and culture of Taos Pueblo. The Pueblo also features shops with arts and crafts, the Taos Mountain Casino, and the annual summer powwow. The patron saint of Taos is San Geronimo with his Saint Day at the end of September. The Pueblo appreciates that visitors are respectful of their “home” and their special rules. Did you know that Picuris Pueblo was once the largest of the Pueblos, but is now one of the smallest of the Tiwa pueblos? Its church, San Lorenzo de Picuris, is over 200 years old. The Picuris village has occupied its present location for 750 years. It has a distinguished buffalo herd. You’ll enjoy the lovely setting of Picuris in Peñasco Valley, off Highway 75. There is fishing, a museum, the church, and the feeling of a lived-in, viable community. Visit the Picuris Pueblo website for more friendly information and history. San Juan Pueblo, in November 2005, officially changed its name back to Ohkay Owingeh, “Place of the Strong People,” its original name that predate the Spanish takeover of the pueblo in the Sixteenth Century. The notable Popē, the Tewa leader of the Pueblo Revolt of 1680, was a native of Ohkay Owingeh. Esther Martinez, linguist and storyteller is another distinguished native. The annual Pueblo Feast Day is June 24. The pueblo can be found east, off Highway 68, of the Casino and visitor’s complex just north of Española.